Alfalfa hay is relatively cheap here in the California high desert because it’s grown here. Horses love it and it’s an easy way to add weight to a horse (feed him more than he needs) or maintain a horse’s weight (you shouldn’t see one single stem in his corral the next time you feed). The reason? Alfalfa is 15.5-18% crude protein, but relatively low in crude fiber—20.8-27.3%. It heats some horses up, and I’m not talking body temperature. 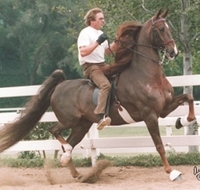 When horse people talk about a “hot” horse, they’re usually describing one with a lot of spirit—one “with a motor” that’s “hot to trot.” Another term is “reactive.” A normally placid horse that isn’t afraid of things and rarely shies can become hot if you feed him grain—and sometimes if you feed him alfalfa, especially if you only ride him sporadically. Alfalfa cubes aren’t ideal—in my opinion, “ideal” means something close to the conditions that horses lived in before humans domesticated them. But it’s very windy here, and sometimes hay will blow right out of my horses’ feeders. (When I first heard somebody say that, I was sure she was exaggerating. She wasn’t.) Even though cubes aren’t ideal, they have their place in my feeding program. They’re also a good way to give a mash to a horse if you don’t use bran (I don’t), but you have to get medication into him somehow. Add water to half a dozen alfalfa cubes and whatever medication he needs and let them sit in a bucket for a few minutes. While you’re waiting, feed the horse and muck out. By then, the mash will be the consistency of pudding—or thicker, depending on how much water you added. If you already know your horse hates the taste of this particular medication, add some applesauce to the mash, and/or molasses. (If it’s winter, substitute pancake syrup for the molasses.) Most horses will eat the mash and their medication. Grass hay is the closest thing to a horse’s “ideal” feed, and Bermuda is a good choice. But it’s been dried and baled, so it’s not exactly like the grass consumed by horses in the wild. (It’s not nearly as coarse, either, and doesn’t require as much chewing to break it down as the wild grasses that horses have eaten for thousands of years in the plains of Central Asia, where the modern horse probably evolved.) 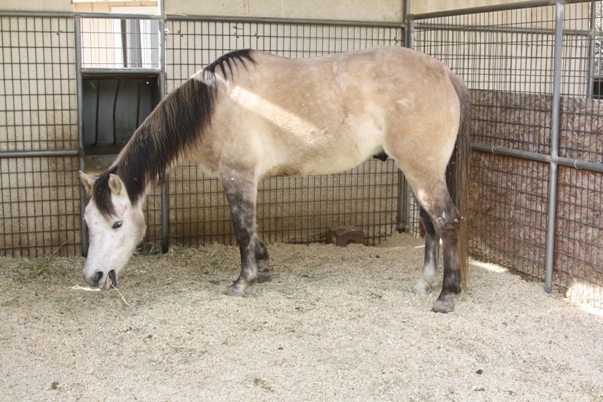 As a result, it may not move through the horse’s digestive tract as quickly as alfalfa hay. It can impact, instead—meaning that it forms a large, immoveable clump, which can cause your horse to colic, which means you’re going to have to put in an emergency call to your veterinarian. So feed it with something else—and in this area, because alfalfa is so cheap, that’s what a lot of people do. Half Bermuda, half alfalfa. Sometimes they’re even grown and baled together. There’s another problem with Bermuda, at least here—the wind. It doesn’t bale as tightly as other hays, so there’s a lot of waste. Unless you have a barn and feed indoors from a wagon or the bed of a pickup, you will lose a lot of hay between the feed shed and the corral. Of course you can go back and pick up all the little clumps that fell off, but that means you have to leave the lid of the feeder open—which means more Bermuda will blow out of the feeder. Sometimes the wind is so bad I have to wear safety goggles when I feed, and I’m not kidding. If you want hay chaff stuck under your eyelids, be my guest. A good alternative is timothy hay. It’s also lower in protein than alfalfa: 6.9-9.6%, and higher in crude fiber: 30.0-31.5. (Bermuda has 7.3-10.6% crude protein, and 26.7-30.4% crude fiber.) There’s much less waste than with Bermuda, most horses like it, and there are no problems with impaction. Sometimes what you feed your horse will be a juggling act between his needs and preferences, and your wallet. 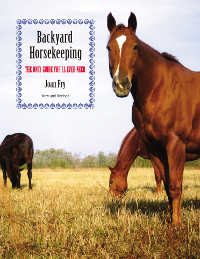 Many horse owners—I’m one of them—feed two types of hay, and although ideally (there’s that word again) you should feed the same mixture every time you feed, some veterinarian schools feed one type of hay in the morning and another at night. That way nobody has to figure out how to divide a flake in half.